With huge thanks to HKBH, we arrived here two days ago. Lots of things to get done, and I have no intention of boring people. But I will offer it as an excuse for doing things in a strange order. It is my intention, BEH, to write a few pieces on why we decided to make the move. (We have been challenged by a good number of people about this!) Meanwhile, I might throw in some anecdotes and impressions,as they occur. 1) In Yerushalayim, I was conscious of being surrounded by people speaking a language that was not my most facile. In Los Angeles, I was more and more frequently surrounded by people whose language I did not understand at all. 3) The PA announcements are different. Waiting on line, someone came on and announced that because of the proximity to shekiah, there would soon be a minyan for mincha (afternoon pra. People interested should go immediately to the shul – in a side room of the store! Why Is This Shiur Different From All Others? Exile ended Iyar 5th 1948, and you have to justify your move home to people? Don’t you dare! We’re the ones that have to justify not joining you. 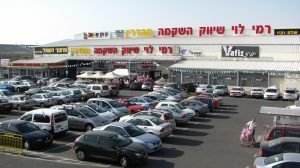 there was a day when you needed an asimon, chilonim and chareidim could live in the same neighborhood and the makolet was a major shopping destination. now, much is changing for the better and the worse. I remember specifically going to a makolet on Jabotinsky a decade ago to give the owner some parnassah. Alas, he is gone. the only local mini-store in a supersol outlet across from Ohel Yitzchok and the OU center. in my home state of NJ, the specialty stores of downtown Westfield, Chatam, and Red Bank are slowly disappearing. vie ess christeled soch azoi yidelte soch. it depresses my wife as we order another item from amazon. You missed mentioning that in Ramy Levy, lines are generally unbearable, and I was told the reason for the often unusual customer service is because they have a policy of hiring people with developmental or other disabilities. Now on the one hand, I often wish that they would give people jobs in other areas of the store that would not affect the length of the checkout process, but I appreciate that this is such a “jewish” problem — an overload of rachamanus. And this waiting is a real middos workout — and often a source of inspiration, when I see people, despite the pressure and pain of 20, 30, 40 minutes on line, behaving with dignity and grace. I have seen people stand for 15 minutes while a customer fumbles through multiple coupons, tokens, and forms that clearly convey their origin in some tomchei Shabbos program, while the line stands stoically, because it would be cruel to bring attention to their method of payment. I have seen people already standing for the better part of an hour allow an elderly person with a full cart cut the line, because they don’t have the koach to stand there and wait. I have seen people shift restlessly from foot to foot while the clearly challenged pakid asks their neighboring coworker what is the code for every other item of produce, because they can’t work the computer well, but without verbalizing their frustration. And pakidim with clear social or emotional issues yelling at customers, who shrugged and smiled mildly back at them. It’s hard to shop there, but it has its rewards.